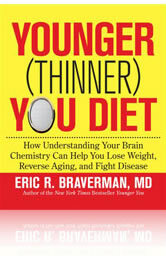 The Younger (Thinner) You Diet – How Understanding Your Brain Chemistry Can Help You Lose Weight, Reverse Aging, and Fight Disease was created by Eric R. Braverman, MD. According to Braverman when we have difficulty losing weight it is because our brain chemistry is imbalanced. He explains how different chemicals in the brain affect aging, weight gain and energy levels while outlining how different foods, spices and teas can help to bring these chemicals back into their proper balance. By following this plan Braverman promises dieters that they will be able to lose weight and keep it off while eating lots of delicious and healthy foods and you will also look and feel younger. Initially dieters undertake a self-assessment test so as to identify the presence of chemical deficiencies and to what degree they are present. From the results of this test you are then instructed which chemical you need to balance first. Braverman discusses the brain chemicals dopamine, serotonin, gamma-aminobutyric acid (GABA) and acetylcholine and explains how imbalances can affect personality, weight management, food addiction and aging. The solution to creating balance in the brain is to adjust the dietary intake and this is achieved by selecting from a wide variety of fresh foods, herbs, spices and teas that have been specially chosen to increase your energy levels and create long-lasting satiety so you won’t feel hungry. Certain foods and herbs are highlighted for their unique effects on specific brain chemicals. For example, foods that boost dopamine can increase metabolism and reduce cravings. Foods that increase GABA can alleviate stress and result in better portion control. The basic dietary structure is a high protein and low carbohydrate diet that includes a goal of nine servings of fruit and vegetables each day.The bulk of your foods will be fruits, vegetables, spices, herbs and teas because these foods are loaded with important vitamins, minerals, and antioxidants which have positive effects on your health. At least three metabolism boosting spices are added to every meal, not only because they make your food taste better, but also because they can help to reduce appetite, enhance brain chemistry, improve digestion, cleanse the body and contain important nutrients. Younger Thinner You also includes advice to show you how to customize his plan so as to reduce the symptoms of specific health conditions such as heart disease and arthritis. Fruit, vegetables, lean meat, low fat dairy, whole grains, herbs, spices, teas. Exercise is an important component of Younger Thinner You because it assists with the regulation of brain chemistry, which also helps to reduce cravings and improve the efficiency of calorie burning. The book includes information that will help you to create a customized exercise plan that boosts your metabolism, improves your mood and strengthens your body. Both strength training and aerobic activities are recommended. The Younger (Thinner) You Diet retails at $15.99. Suitable for long-term weight maintenance. Will help to promote healthy aging. Helps dieters to understand one possible cause of overeating. Plan can be customized to address specific health conditions. Includes recipes and shopping lists. Some of the recommendations are not adequately supported by research. Younger Thinner You offers dieters a sensible dietary plan that highlights optimal nutrition through a high intake of fruit and vegetables. The emphasis on the use of herbs and spices adds a unique aspect to this program and will increase the enjoyment of healthy foods, however the metabolism-boosting effects of spices is debatable. Dieters who follow this plan are likely to lose weight and improve their health, however this will probably be related more to a reduction in calories and improvement of the diet in general, rather than altered brain chemistry.